Create a quaint, romantic getaway without leaving your home. Dinner date, movie, a stroll in Singapore Botanical Gardens—sure they’re all romantic activities that let you and your loved one get your much-deserved one on one. But you can only do these so many times before you eventually get tired of them. Plus, they cost you more than you think. 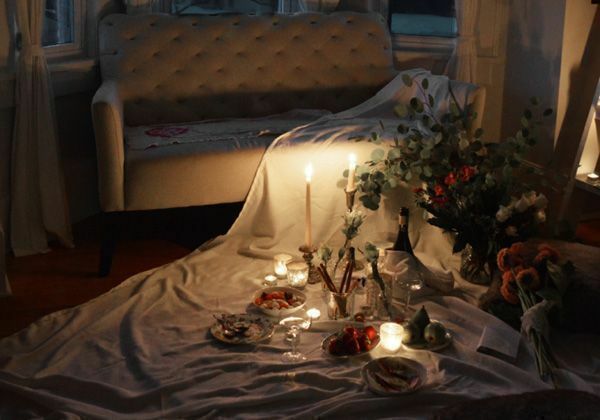 How about staying home for once yet still have that charmingly romantic vibe by packing an indoor picnic for two? Here’s how. Create a blanket fort. Simply lay out some quilts and blankets, hang them up from the ceiling using string or propping them up on furniture, and turn down the lights. If you’d like to dine in candlelight, best to use LED-lit candles, so you won’t run the risk of burning all those sheets in the process! Use picnic-sized stuff. Really create the outdoor picnic feel indoors by using picnic-sized plates, baskets, or bins, disposable wooden utensils, and paper cups. If you’ve got an artificial turf rug somehow lying around, utilise that too! Place your drinks, soups, and other liquids in a trusty ol’ thermos or picnic canisters. Not only does this impart the picnic vibe, but it also prevents spillages as you can stretch your legs, arms, lie down without bumping into glasses, plates, and bowls. Have picnic food that’s easy to handle, munch on, and nibble. Pick salads or fruits that aren’t too fussy to eat or won’t require you to use both knife and fork. Fruit and veggie kabobs are perfect picnic fare (you can also turn it into a chocolate or cheese fondant spread!). Deli sandwiches are also easy to prepare, or you can just buy them from your favourite deli and wrap them in wax paper. You can also go the Pinterest route and serve pasta (warm or cold, it doesn’t matter, you’re at home anyway!) in a jar. Got any more fun activity ideas for the home? Email us at hello@cromly.com!